Ipinaliwanag ni Dr. Milwida Guevara sa palatuntunan ni Jessica Soho ang 6.11 overall grade ni Pangulong Aquino mula sa MGG. MGG started benchmarking the performance of the Aquino administration in 2010 using a scorecard system to assess the extent to which the administration has implemented the platform of the President. To help ensure an objective assessment process, scoring is done based on results that are based on data and not on perceptions. The MGG notes with favor the increasing performance of the Aquino administration in managing the economy, public finance, and delivery of health services. No significant improvement has been observed in the development of the agricultural sector. 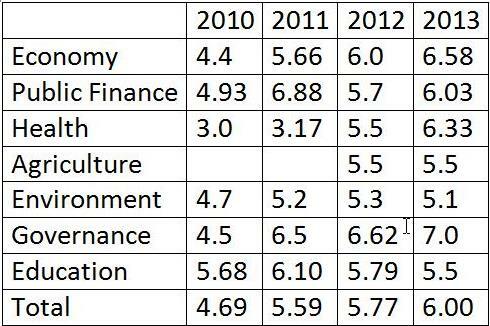 The total score of the performance of the administration is 6.0 which higher than the score in 2012. The MGG lauds the achievement of the targets in the investment to GDP ratio, improving the global competitiveness of the Philippines particularly in doing business, and the attainment of the peace agreement with the Bangsamoro. The achievement of the target in employment generation should be noted with caution since it was attained through a reduction in the target. MGG notes the progress of the administration in achieving the goals of its infrastructure program, maintaining macro-stability, provision of universal health care, and attainment of health-related MDGs. The programs of the administration in improving governance are sincerely acknowledged. The government proved its intent to pursue “Tuwid na Daan” through the institution of reforms in budgeting such as zero-based management, the results based- performance- management system, and providing the public with broad access to information, especially on how the budget has been disbursed. The Performance Incentive System that was instituted by Secretary Robredo has been sustained by the DILG and is in fact being strengthened. Government continues its campaign against corruption through the filing of cases against those who have alleged to use the PDAF for personal gains. The major criticism against the administration is its partisanship in carrying the fight against corruption. The fervor in prosecuting allies has been relatively tame and weak. MGG notes that efforts are made in achieving the targets in revenue-generation, promoting the competitiveness of the agricultural sector, provision of post-harvest facilities, and promoting agricultural development in Mindanao. However, the results of the programs are lower than expected. Low marks are given on the poverty reduction program, the export to GDP ratio, observance of the rule of law, control of private armies, the import program on basic commodities like rice, and, bio-security, i.e. protection of the country from pests, diseases, and toxic substances. The performance of education was given a lower score of 5.5 compared to 5.79 last year. The drop in DepED rating in 2014 is due to problems with implementation. The major policy reforms have been promulgated as law or as DepED directive. It is in the implementation of policy that DepED scored lower. A lower score was given to the performance of the administration in environmental management due to the slow pace of reforms in implementing the climate change framework, the poor post-disaster rehabilitation efforts, reforestation, and provision of safer sources of energy. MGG emphasizes the need to strengthen the universal health care program of government noting that 47.6 percent of deaths in the country are unattended by physicians, the low ratio of health care workers to the population, the high out-of pocket expenses of patients, the high maternal mortality rate, and the rising cases of AIDS. These are the major challenges that the country faces. MGG highlights the need for efficient and speedy implementation of the programs of the administration on environmental management particularly its climate change action program, reforestation, regulation of investments on mining, and environmental laws. The government scored a perfect 10 for maintaining a high and sustained level of economic growth and managing inflation. The Movement for Good Governance (MGG), chaired by Prof. Solita Monsod, lauded the accomplishments of the President in maintaining macro-stability, managing the budgetary deficit, and reducing the debt burden. MGG commended the Performance Incentive System for local governments that was put in place by Secretary Jesse M. Robredo and the Bottom-up Budgeting and Open Government initiatives by the Department of Budget and Management. Low scores were given to the sluggish performance of the export sector, the decrease in employment opportunities, and the disappointingly small reduction in population poverty incidence for the first semester of 2012, 27.9 percent compared to 28.6 percent in 2009. MGG expressed disappointment in the slow pace in the implementation of the Public-Private Partnership. The improvement in the tax effort was observed to be slow, from 12.4 percent in 2011 to 12.9 percent in 2012. This was despite the numerous changes and revisions that the BIR introduced in tax rules and regulations. MGG expressed alarm over the uncertainty and instability that these constant revisions cause. “It paves the way for arbitrariness and a personality-driven governance,” MGG observed. MGG noted that the BOC was never on track in reaching its revenue-target and has failed to control the problem of smuggling. The score given to the delivery of the government’s health program was 5.5. The gains in the increase in coverage of the national health insurance were noted, as well as the passage of the Sin Tax Law. Despite these however, MGG reports that out-of-pocket expenses of patients are still high in medical care, ranging from 55 percent to 84 percent of the costs. Access of the poor to quality health care was described as inadequate and MGG notes that there are only 18,000 barangay health stations out of 42,000 barangays. MGG expressed alarm on the increase in the maternal mortality rate, 221 deaths per 100,000 live births compared to 94 deaths in 2008. In the area of education, MGG describes the implementation of K-12 as “incrementalist” since the DepED rolls out the curricula year by year instead of making available the entire new basic education curriculum. Madaris education was noted to be slow moving and remains predominantly private and Mosque-based. While the government’s efforts in building more schools were positively noted, MGG cites that the large-scale public-private partnership in classroom construction builds classroom in many already-overcrowded schools. MGG gave the education program a score of 5.79. Apprehension was expressed in the preparedness of government to implement the Climate Change Action Plan, as well as the increasing dependence on coal as a primary source of fuel. Between 2009 and 2010, the percentage share of coal in power generation increased from 27 percent to 34 percent. MGG is alarmed that the Philippines has less than 10 percent of its forest cover and only 39 percent of the 525 water bodies are potential sources of drinking water. In the area of governance, MGG says that the government has kept its promise of synchronizing the ARMM election with the national election in 2013 to prepare the region for an honest and fair election. However, MGG noted the lack of playing field considering that the appointed OIC was allowed to run despite earlier pronouncement of the Office of the President that this would grant him an undue advantage. MGG cites reports that many precincts that had a 100 percent voters’ turnout, a “statistically improbable development”. Governance received the highest score of 7 and the trust and confidence of the public on the personal integrity of the President was cited. MGG commended government for the growth in agriculture but notes that the Philippines dismally lags behind ASEAN peers in the production of agri-food exports. The export per capita of Thailand was US$677, and US$1,320 in Malaysia. MGG recommends a program of meritocracy in the Department of Agriculture and is dismayed that over 50 percent of the staff in the Department of Agriculture are “job orders” or contractuals. The refusal of the Bureau of Customs to pre-inspect food imports was cited as endangering the country with pest, diseases, and toxic substances. MGG concludes that the government is making gains in what the President promised, albeit with a slow pace in poverty reduction, employment generation, raising the tax effort, providing quality health care to the poor, implementing education reforms, and environmental management.